First, rinse and slice lengthwise the zucchini. 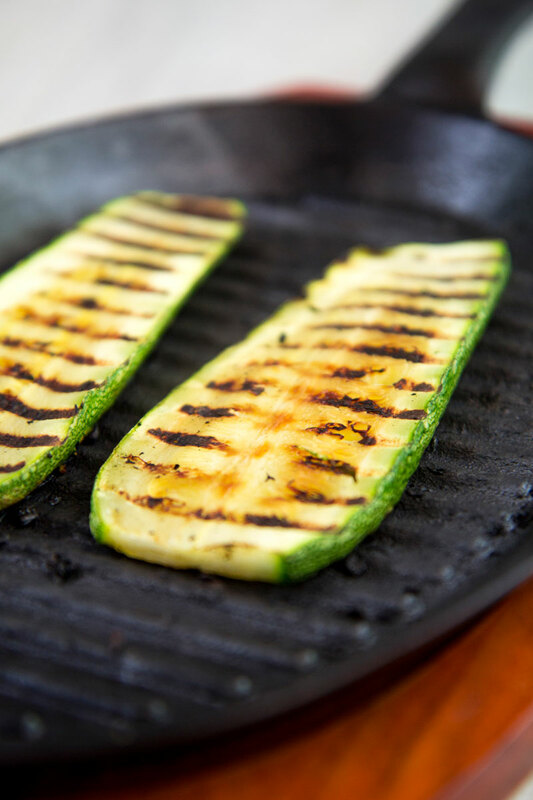 Now, grill the zucchini slices on a scalding grill pan until well seared. 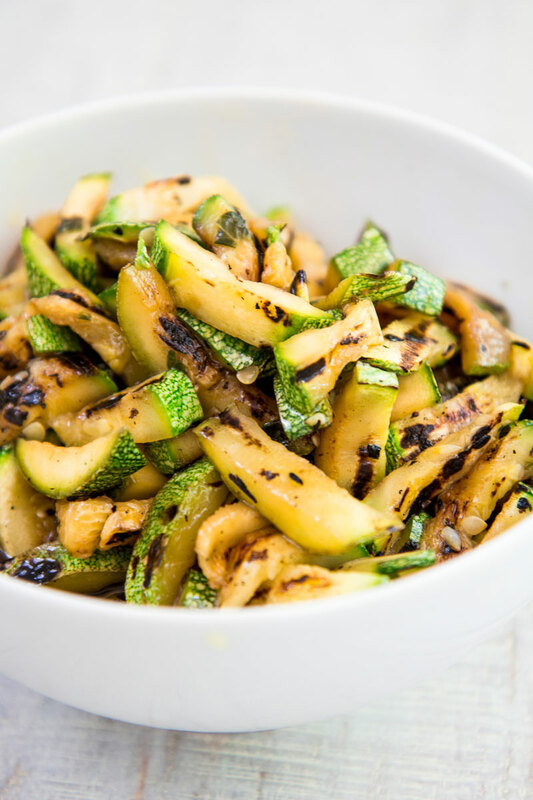 After that, reduce the zucchini into pieces and season with 3 tbsp of olive oil a pinch of salt and 10 leaves of fresh mint minced. Finally, pour the vegetables into a bowl, wrap and let them marinate. Now, peel and mince the onion, then pour in a saucepan along with 3 tbsp of olive oil, 2 peeled and crushed cloves of garlic, 1/2 tsp of Cayenne pepper, and 1/2 tsp of coriander seeds powder. Saute the onions over medium/low heat until soft and translucent, stirring occasionally. Pour the lentils into a sieve and rinse under running water. Then, pour the lentils into the saucepan along with enough water to cover them, and 1 tsp of turmeric powder. 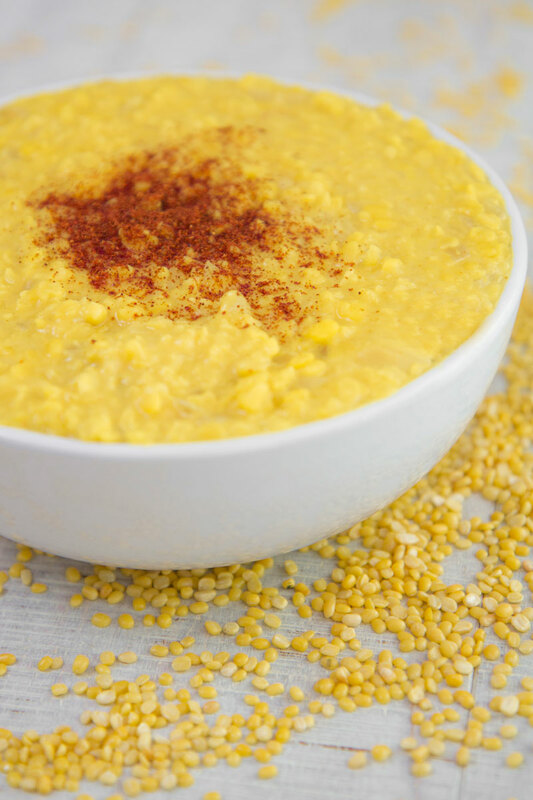 Cook the yellow lentils until they become tender and start to fall apart. Finally, complete with 1/2 tsp of black pepper and salt as needed. Pour 1 cup of Basmati rice in a sieve and rinse under running water stirring to eliminate the starch. Now, pour the rice in a little pot along with 1.5 cups of hot water, cover with the lid and place over medium heat. Simmer the rice for 8 to 10 minutes until the rice has absorbed all the water. It is critical do not raise the lid until the rice is cooked, so you need some experience. 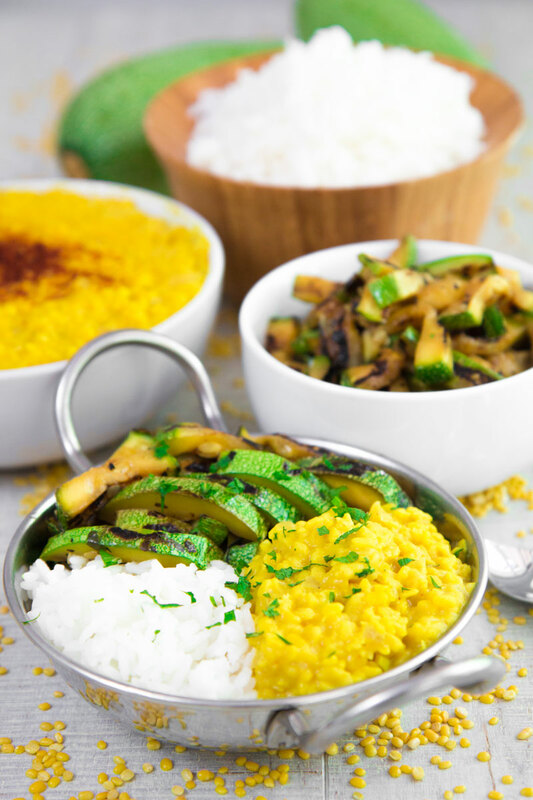 Finally, compose the bowls with the grilled zucchini, the yellow lentils curry, and the Basmati rice. Now, peel and mince the onion, then pour in a saucepan along with 3 tbsp of olive oil, 2 peeled and crushed cloves of garlic, ½ tsp of Cayenne pepper, and ½ tsp of coriander seeds powder. Saute the onions over medium/low heat until soft and translucent, stirring occasionally. Pour the lentils into a sieve and rinse under running water. 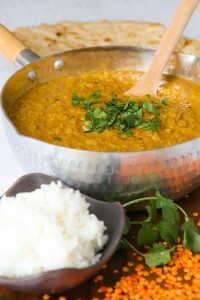 Then, pour the lentils into the saucepan along with enough water to cover them, and 1 tsp of turmeric powder. 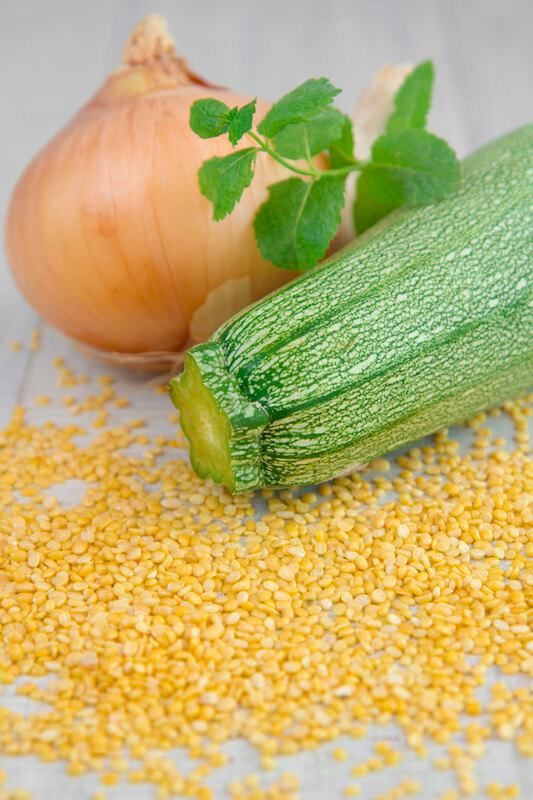 Cook the yellow lentils until they become tender and start to fall apart. Finally, complete with ½ tsp of black pepper and salt as needed. 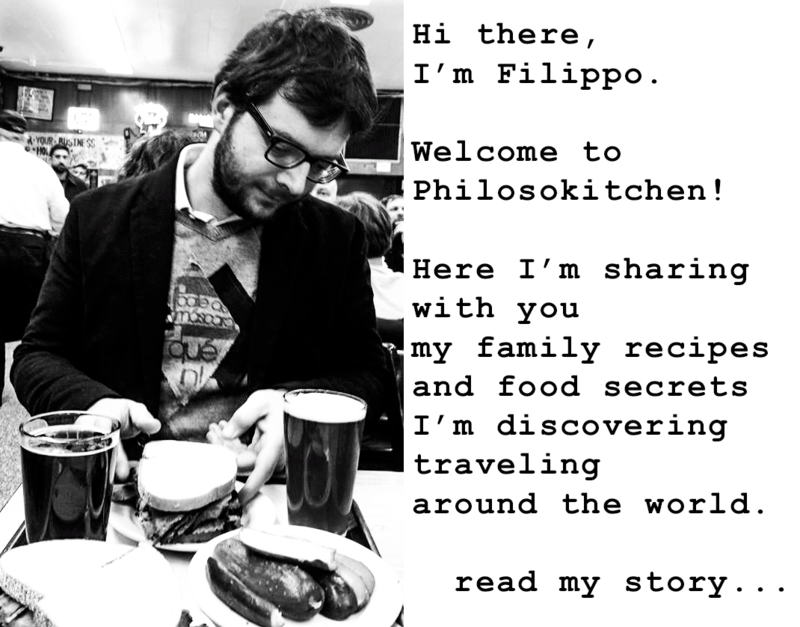 « TRIPE RECIPE FLORENTINE WAY (trippa fiorentina) – All You Need To Know! Amazingly authentic recipes and lovely history. Also as last step… Tempering the curry with a table spoon of melted boiling butter (or ghee) with a teaspoon of caraway seeds and one dried red chilly. Add the seeds to smoking butter and let them crackle and brown up but not burnt and garnishing the curry with it.